COLOR(S): Black, red, blue merle, red merle with or without white markings and/or tan points. Miniature Australian Shepherd puppies and dogs make wonderful companions and can also enjoy working with small stock. They are well-balanced, alert and athletic but have a playful side, making them love children. These sensitive and confident dogs are easy to train, make good guardians and are devoted to their families. Except for their size, Mini Aussies are the exact replica of their larger counterpart, the Australian Shepherd. While some people consider the Australian Shepherd to have three separate sizes of dogs – Standard, Miniature and Toy – others group the Toy and Mini into the same category. Either way, all versions of the Australian Shepherd are identical save for size. Australian Shepherd miniature puppies and dogs are quaint, compact dogs with a sturdy body and medium length fur covering their bodies. 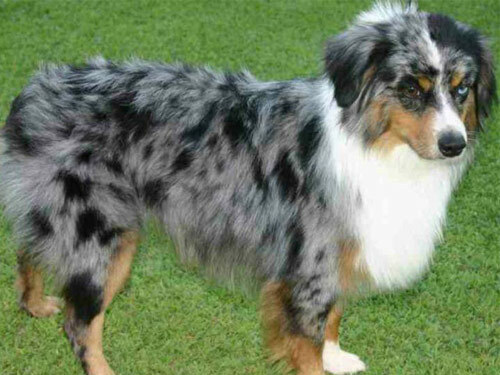 Their coat features markings and colors of blue merle, black, red, merle, totally red with or without white and with or without tan points. These fun loving and hardworking dogs have triangular drop ears and eyes that can be various colors such as blue, brown, amber or any combination of the three. Miniature Australian Shepherd puppies and dogs are friendly and loving and make excellent companions and friends. Miniature Australian Shepherd puppies and dogs are very enthusiastic and make a versatile companion and family dog. They are affectionate with their owners and love to be playful, allowing them to get along well with children. However, they do have a high prey drive and are not trustworthy with smaller animals. Comparatively, Mini Aussies do get along well with other dogs. While they will never be aggressive, they are wary of strangers. Like their larger counterparts, the very intelligent Australian Shepherd miniature puppies and dogs have a strong instinct to herd and guard. Additionally, these dogs have acute problem solving abilities and will be very obedient when trained. Miniature Australian Shepherds will actually enjoy obedience classes and training. To minimize shedding of the medium length double coat, regular brushing of the Miniature Australian Shepherd should happen once or twice a week. This will keep the coat and skin healthy. The Mini Aussie’s double coat can be straight to slightly wavy and is generally moderately harsh with a dense undercoat. Other than a few health concerns, Miniature Australian Shepherd puppies and dogs are a relatively healthy breed. They may have several eye problems including Progressive Retinal Atrophy (PRA) or Collie Eye Anomaly. This breed can also be prone to allergies and hip dysplasia. Similar to most other herding dogs, the Mini Aussie needs exercise to remain healthy and well balanced. Exercise options for this breed can include daily walks, obedience training or giving the dog a job to do. For Australian Shepherd miniature puppies and dogs, early socialization is necessary. This is a rather intelligent breed and should take well to obedience training. This type of training should come easily and even be enjoyed by Mini Aussies.